The Spinal Kinetics M6 artifical cervical disc replacement is designed to replicate the structure and performance of a healthy disc. Its innovative design incorporates an artificial nucleus to allow shock absorption and a woven fiber annulus for controlled motion in all directions. These characteristics accurately replicate the healthy disc, allowing the disc replacement implant to work in concert with the remaining human discs. 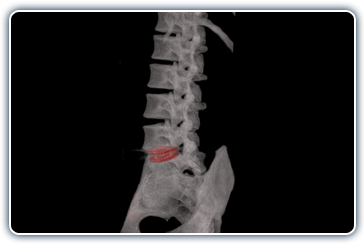 Unlike earlier disc replacement designs with M6 the resulting natural functionality of the entire spinal curve should provide the best chance for a full recovery, and prevent additional adjacent level degeneration. This "Quality of Motion" is major benefit not available in any other implant we have seen! "The kinematic signatures of the intact human disc and the M6 artificial disc are nearly identical"
"There has been no serious device-related adverse events, surgical re-interventions, or evidence of device migration, expulsion, or subsidence in this study group"
"Findings indicate substantial clinical improvement for all function, pain, and quality of life outcomes in addition to maintenance of ROM and increase in disc height at the treated level(s). The findings also exhibit an acceptable safety profile, as indicated by the absence of serious adverse events and reoperations following arthroplasty with a next-generation artificial cervical disc replacement device. "The M6 disc replacement implant remains fully intact and functional after functional kinematic testing to 20 Million cycles of combined motion; physiologic dynamic compression, compression shear, and torsion; creep to the equivalent of 100 years! These complication risks include adjacent disc degeneration and facet joint damage found with early "ball in socket" designs, not seen in the M6 patients, and M6 has not been found to cause the ossification, as found in other early generation compressible implants. "The disc remains fully intact and functional after functional kinematics testing to 20 Million cycles of combined motion; physiologic dynamic compression, compression shear, and torsion, creep to the equivalent of 80 years".